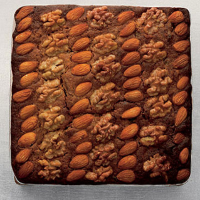 This is a delicious, moist cake, crammed full of fruits and finished with nuts. The cake is designed to be made within the last few days leading up to Christmas, so no maturing is necessary. You can replace the brandy with apple juice if you prefer. Preheat the oven to 150°C, gas mark 2. Line the base and sides of a deep cake tin, 20cm square or 23cm round, with a double layer of greaseproof paper. Put the orange juice, brandy and all the dried fruit into a saucepan. Heat until simmering. Cook gently for 5 minutes, stirring occasionally. Remove from the heat and leave to cool. Sift the flour and spices together in a bowl and stir in the ground almonds. In a large bowl, cream the butter and sugar together until light and fluffy. Beat in the eggs, bit by bit. If the mixture curdles, add 2 tbsp of the measured flour mixture. Add the fruit and the remaining flour mixture. Fold in with a metal spoon. Spoon the mixture into the prepared tin and smooth the surface. Tap the tin on the work surface to dislodge any trapped air. Decorate with the walnuts and almonds. Cover the tin loosely with foil then bake the cake in the middle of the oven for 3 hours. Remove the foil and cook for a further 30 minutes or until a skewer inserted into the centre of the cake comes out clean. Cool the cake in the tin then turn out and remove the paper. Store in an airtight tin for up to 7 days before serving.